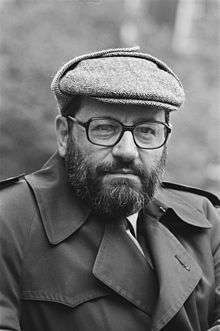 Umberto Eco OMRI (Italian: [umˈbɛrto ˈɛːko]; 5 January 1932 – 19 February 2016) was an Italian novelist, literary critic, philosopher, semiotician, and university professor. He is best known internationally for his 1980 novel Il nome della rosa (The Name of the Rose), a historical mystery combining semiotics in fiction with biblical analysis, medieval studies, and literary theory. He later wrote other novels, including Il pendolo di Foucault (Foucault's Pendulum) and L'isola del giorno prima (The Island of the Day Before). His novel Il cimitero di Praga (The Prague Cemetery), released in 2010, was a best-seller. Eco also wrote academic texts, children's books, and essays. He was the founder of the Department of Media Studies at the University of the Republic of San Marino, president of the Graduate School for the Study of the Humanities at the University of Bologna, member of the Accademia dei Lincei, and an honorary fellow of Kellogg College, Oxford. Eco was born in the city of Alessandria, in Piedmont in northern Italy. His father, Giulio, one of thirteen children, was an accountant before the government called him to serve in three wars. During World War II, Umberto and his mother, Giovanna (Bisio), moved to a small village in the Piedmontese mountainside. Eco received a Salesian education and made references to the order and its founder in his works and interviews. His family name is supposedly an acronym of ex caelis oblatus (from Latin: a gift from the heavens), which was given to his grandfather (a foundling) by a city official. Umberto's father urged him to become a lawyer, but he entered the University of Turin to take up medieval philosophy and literature, writing his thesis on Thomas Aquinas and earning a Laurea degree in philosophy in 1954. During his university studies, Eco stopped believing in God and left the Catholic Church. After that, Eco worked as a cultural editor for the state broadcasting station Radiotelevisione Italiana (RAI) and lectured at the University of Turin (1956–1964). A group of avant-garde artists, painters, musicians and writers, whom he had befriended at RAI (Gruppo 63), became an important and influential component in Eco's writing career. This was especially true after the publication of his first book in 1956, Il problema estetico in San Tommaso, which was an extension of his Laurea thesis. This also marked the beginning of his lecturing career at his alma mater. In September 1962 he married Renate Ramge, a German art teacher with whom he had a son and a daughter. He divided his time between an apartment in Milan and a vacation house near Urbino. He had a 30,000 volume library in the former and a 20,000 volume library in the latter. He was a visiting professor at Columbia University several times in the 1980s and 1990s. In 1992–1993 Eco was the Norton professor at Harvard University. On 8 May 1993, Eco received an honorary Doctor of Humane Letters (D.H.L.) from Indiana University Bloomington in recognition of his over fifteen-year association with the university's Research Center for Language and Semiotic Studies. Six books that were authored, co-authored, or co-edited by Eco were published by the Indiana University Press. He frequently collaborated with his friend Thomas Sebeok, semiotician and Distinguished Professor of Linguistics at Indiana University. 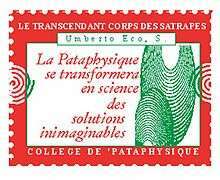 He became Satrap of the Collège de ‘Pataphysique in 2001. On 23 May 2002, Eco received an honorary Doctor of Letters (D.Litt.) from Rutgers University in New Brunswick, New Jersey. In 2009, the University of Belgrade in Serbia awarded him an honorary doctorate. Eco was a member of the Italian skeptic organization Comitato Italiano per il Controllo delle Affermazioni sulle Pseudoscienze (Italian Committee for the Investigation of Claims of the Pseudosciences) CICAP. Eco died at his Milanese home of pancreatic cancer, from which he had been suffering for two years, on the night of 19 February 2016. At the time of his death at the age of 84, he was a professor emeritus at the University of Bologna, a position that he had held since 2008. In 1959 Eco published his second book, Sviluppo dell'estetica medievale (The Development of Medieval Aesthetics), on medieval philosophy. After 18 months' military service in the Italian Army, he left RAI in 1959 to become the senior non-fiction editor of the Bompiani publishing house in Milan, a position he occupied until 1975. Eco began seriously developing his ideas on the "open" text and on semiotics, writing many essays on these subjects, and in 1962 he published Opera aperta (translated into English as "The Open Work"). In it, Eco argued that literary texts are fields of meaning, rather than strings of meaning, that they are understood as open, internally dynamic and psychologically engaged fields. Literature which limits one's potential understanding to a single, unequivocal line, the closed text, remains the least rewarding, while texts that are the most active between mind, society and life (open texts) are the liveliest and best—although valuation terminology is not his primary focus. Eco came to these positions through study of language and from semiotics, rather than from psychology or historical analysis (as did theorists such as Wolfgang Iser, on the one hand, and Hans Robert Jauss, on the other). Eco's short 1961 essay "Fenomenologia di Mike Bongiorno" ("Phenomenology of Mike Bongiorno", on the most popular quiz show host in Italy) received much notoriety among the general public and has drawn endless questions by journalists at every public appearance by Eco; the essay was later included in the collection Diario minimo (1963). His book Apocalittici e integrati (1964) analyzes the phenomenon of mass communication from a sociological perspective. In 1967 he gave the influential lecture "Towards a Semiological Guerrilla Warfare", which coined the influential term "semiological guerrilla," and influenced the theorization of guerrilla tactics against mainstream mass media culture, such as guerrilla television and culture jamming. Among the expressions used in the essay are "communications guerrilla warfare" and "cultural guerrilla." The essay was later included in Eco's book Faith in Fakes. Eco founded and developed one of the most important approaches in contemporary semiotics, usually referred to as interpretative semiotics. The main books in which he elaborates his theory are La struttura assente (1968; literally: The Absent Structure), A Theory of Semiotics (1975), The Role of the Reader (1979), Semiotics and Philosophy of Language (1984), The Limits of Interpretation (1990), Kant and the Platypus (1997), and From the Tree to the Labyrinth: Historical Studies on the Sign and Interpretation (2014). Eco co-founded Versus: Quaderni di studi semiotici (known as VS among Italian academics), a semiotic journal. VS is used by scholars whose work is related to signs and signification. The journal's foundation and activities have contributed to semiotics as an academic field in its own right, both in Italy and in the rest of Europe. Most of the well-known European semioticians, including Eco, A. J. Greimas, Jean-Marie Floch, and Jacques Fontanille, as well as philosophers and linguists like John Searle and George Lakoff, have published original articles in VS. His work with Serbian and Russian scholars and writers included thought on Milorad Pavic and a meeting with Alexander Genis. In 1988, at the University of Bologna, Eco created an unusual program called Anthropology of the West from the perspective of non-Westerners (African and Chinese scholars), as defined by their own criteria. Eco developed this transcultural international network based on the idea of Alain le Pichon in West Africa. The Bologna program resulted in a first conference in Guangzhou, China, in 1991 entitled "Frontiers of Knowledge." The first event was soon followed by an Itinerant Euro-Chinese seminar on "Misunderstandings in the Quest for the Universal" along the silk trade route from Canton to Beijing. The latter culminated in a book entitled The Unicorn and the Dragon, which discussed the question of the creation of knowledge in China and in Europe. Scholars contributing to this volume were from China, including Tang Yijie, Wang Bin and Yue Daiyun, as well as from Europe: Furio Colombo, Antoine Danchin, Jacques Le Goff, Paolo Fabbri and Alain Rey. In 2000 a seminar in Timbuktu, Mali, was followed up with another gathering in Bologna to reflect on the conditions of reciprocal knowledge between East and West. This in turn gave rise to a series of conferences in Brussels, Paris and Goa, culminating in Beijing in 2007. The topics of the Beijing conference were "Order and Disorder","New Concepts of War and Peace", "Human Rights" and "Social Justice and Harmony". Eco presented the opening lecture. Among those giving presentations were anthropologists Balveer Arora, Varun Sahni, and Rukmini Bhaya Nair from India, Moussa Sow from Africa, Roland Marti and Maurice Olender from Europe, Cha Insuk from Korea, and Huang Ping and Zhao Tinyang from China. Also on the program were scholars from the fields of law and science including Antoine Danchin, Ahmed Djebbar and Dieter Grimm. Eco's interest in East-West dialogue to facilitate international communication and understanding also correlates with his related interest in the international auxiliary language Esperanto. Eco's fiction has enjoyed a wide audience around the world, with many translations. His novels are full of subtle, often multilingual, references to literature and history. Eco's work illustrates the concept of intertextuality, or the inter-connectedness of all literary works. Eco cited James Joyce and Jorge Luis Borges as the two modern authors who have influenced his work the most. Eco employed his education as a medievalist in his first novel The Name of the Rose (1980), a historical mystery set in a 14th-century monastery. Franciscan friar William of Baskerville, aided by his assistant Adso, a Benedictine novice, investigates a series of murders at a monastery that is to host an important religious debate. The novel contains many direct or indirect metatextual references to other sources, requiring the detective work of the reader to 'solve'. The title is unexplained in the book. As a symbol, the rose is ubiquitous enough not to confer any single meaning. There is a tribute to Jorge Luis Borges, a major influence on Eco, in the blind monk and librarian Jorge of Burgos: Borges, like the character Jorge, lived a celibate life consecrated to his passion for books, and also went blind in later life. William of Baskerville is a logically-minded Englishman who is a friar and a detective, and his name evokes both William of Ockham and Sherlock Holmes (by way of The Hound of the Baskervilles); several passages describing him are strongly reminiscent of Sir Arthur Conan Doyle's descriptions of Holmes. The underlying mystery of the murder is borrowed from the "Arabian Nights". The Name of the Rose was later made into a motion picture starring Sean Connery, F. Murray Abraham, Christian Slater and Ron Perlman, which employs the plot, but, not the philosophical and historical themes from the novel. In Foucault's Pendulum (1988), three under-employed editors who work for a minor publishing house decide to amuse themselves by inventing a conspiracy theory. Their conspiracy, which they call "The Plan", is about an immense and intricate plot to take over the world by a secret order descended from the Knights Templar. As the game goes on, the three slowly become obsessed with the details of this plan. The game turns dangerous when outsiders learn of The Plan, and believe that the men have really discovered the secret to regaining the lost treasure of the Templars. The Island of the Day Before (1994) was Eco's third novel. The book, set in the seventeenth century, is about a man marooned on a ship within sight of an island which he believes is on the other side of the international date-line. The main character is trapped by his inability to swim and instead spends the bulk of the book reminiscing on his life and the adventures that brought him to be marooned. Baudolino was published in 2000. Baudolino is a knight who saves the Byzantine historian Niketas Choniates during the sack of Constantinople in the Fourth Crusade. Claiming to be an accomplished liar, he confides his history, from his childhood as a peasant lad endowed with a vivid imagination, through his role as adopted son of Emperor Frederick Barbarossa, to his mission to visit the mythical realm of Prester John. Throughout his retelling, Baudolino brags of his ability to swindle and tell tall tales, leaving the historian (and the reader) unsure of just how much of his story was a lie. The Mysterious Flame of Queen Loana (2005) is about Giambattista Bodoni, an old bookseller specializing in antiques who emerges from a coma with only some memories to recover his past. Bodoni is pressed to make a very difficult choice, one between his past and his future. He must either abandon his past to live his future or regain his past and sacrifice his future. The Prague Cemetery, Eco's sixth novel, was published in 2010. It is the story of a secret agent who "weaves plots, conspiracies, intrigues and attacks, and helps determine the historical and political fate of the European Continent." The book is a narrative of the rise of Modern-day antisemitism, by way of the Dreyfus affair, The Protocols of the Elders of Zion and other important 19th century events which gave rise to hatred and hostility toward the Jewish people. Numero Zero was published in 2015. Set in 1992 and narrated by Colonna, a hack journalist working on a Milan newspaper, it offers a satire of Italy's kickback and bribery culture as well as, among many things, the legacy of Fascism. A semiotic Landscape. Panorama sémiotique. Proceedings of the Ist Congress of the International Association for Semiotic Studies, Den Haag, Paris, New York: Mouton (=Approaches to Semiotics, 29) (with Seymour Chatman and Jean-Marie Klinkenberg). The Role of the Reader: Explorations in the Semiotics of Texts (1979 – English edition containing essays from Opera aperta, Apocalittici e integrati, Forme del contenuto (1971), Il Superuomo di massa, Lector in Fabula). Ten essays on methods of abductive inference in Poe's Dupin, Doyle's Holmes, Peirce and many others, 236 pages. ↑ "Umberto Eco Biography". eNotes. Retrieved 23 April 2016. ↑ Liukkonen, Petri. "Umberto Eco". Books and Writers (kirjasto.sci.fi). Finland: Kuusankoski Public Library. Archived from the original on 26 November 2014. ↑ Farndale, Nigel (24 May 2005). "Heavyweight champion". The Daily Telegraph. Retrieved 23 October 2009. ↑ "Honorary Doctors". Serbia: University of Belgrade. Archived from the original on 3 May 2012. Retrieved 11 June 2012. ↑ McMahon, Barbara (6 October 2005). "No blood, sweat or tears". The Guardian. Retrieved 28 July 2009. ↑ "Umberto Eco stroncato da un tumore al pancreas. Martedì omaggio al Castello Sforzesco" (in Italian). Il Messaggero. 20 February 2016. Retrieved 20 February 2016. 1 2 Gerino, Claudio (19 February 2016). "Morto lo scrittore Umberto Eco. Ci mancherà il suo sguardo sul mondo". la Repubblica (in Italian). Gruppo Editoriale L'Espresso. Retrieved 19 February 2016. ↑ "Umberto Eco, Italian author of 'The Name of the Rose,' dies at 84". Reuters. 20 February 2015. Retrieved 20 January 2016. ↑ "Italian author Umberto Eco dies aged 84". The Guardian. 20 February 2016. Retrieved 20 February 2016. ↑ "Remembering Umberto Eco". The Atlantic. Retrieved 19 February 2016. ↑ Kandell, Jonathan (19 February 2016). "Umberto Eco, 84, Best-Selling Academic Who Navigated Two Worlds, Dies". The New York Times. Retrieved 23 April 2016. ↑ Strangelove, Michael (2005). The Empire of Mind: Digital Piracy and the Anti-Capitalist Movement. University of Toronto Press. pp. 104–5. ISBN 0802038182. ↑ Bondanella (2005) pp. 53, 88–9. ↑ Clee, Nicholas (27 May 2012). "This is Not the End of the Book by Umberto Eco and Jean-Claude Carrière – review". The Guardian. Retrieved 21 February 2016. ↑ fveltri. "About idiots and churnalism". News Of PR Interest. Retrieved 2016-04-23. ↑ Genis, Daniel. "Driving Umberto Eco". www.airshipdaily.com. Retrieved 2 May 2015. ↑ Vegetal and mineral memory, EG: Ahgram, November 2003, archived from the original on 1 February 2004, retrieved 1 February 2007 Considers, among other things, encyclopedias. ↑ Eco, Umberto (1985). Reflections on The Name of the Rose. W. Weaver (trans.). London: Martin Secker & Warburg Limited. ↑ Eco, Umberto (1986). The Name of the Rose. New York: Warner Books. p. 10. ISBN 0-446-34410-9. ↑ Doyle, Arthur Conan (2003). Sherlock Holmes: The Complete Novels and Stories Vol 1. New York: Bantam Books. p. 11. ISBN 0-553-21241-9. ↑ Ian Thomson, Evening Standard, 12 November 2015. Wikimedia Commons has media related to Umberto Eco. Lila Azam Zanganeh (Summer 2008). "Umberto Eco, The Art of Fiction No. 197". Paris Review. "We Like Lists Because We Don't Want to Die" interview by Susanne Beyer and Lothar Gorris. "Umberto Eco collected news and commentary". The Guardian.